The sound of bleating lambs pierced the air during yesterday’s shift at the farm. It was a sad sound because we know their destiny. Above is a photo of goats instead. I made 60 trays of soil blocks for the germination shed. It’s time to transplant pepper plants from plastic trays where they germinated to individual soil blocks for finishing before planting. There are a lot of them. I was to do 78 trays, but a thunderstorm blew over, dropping a brief torrent of rain and hail — enough hail to sting our skin. All of us —four people, two dogs and a cat — made our way into the germination shed to wait out the storm. It didn’t take long. The storm was an emphatic punctuation ending the day’s work. Between Passover and Easter none of our lambs was sacrificed despite the popularity of leg of lamb as a holiday main course. 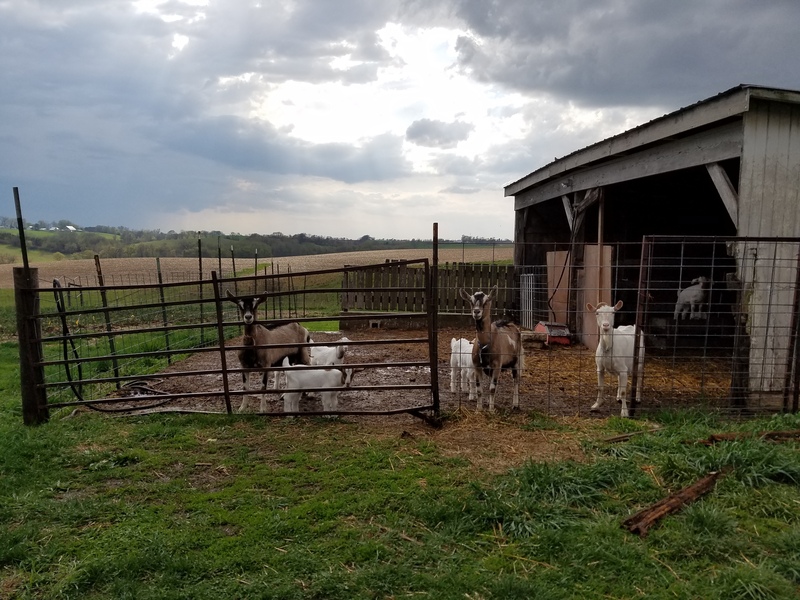 On a farm we accept the reasons for raising lambs and goats, and the reality of thunderstorms. I barter my work. Soil blocking yields participation in selected shares, notably the spring share which begins April 24, and fall shares from both farms. 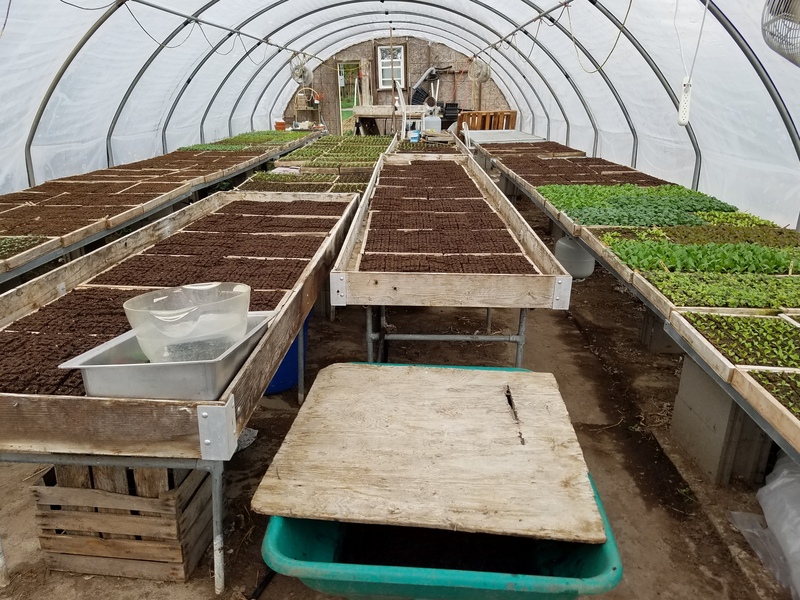 It is a way to leverage the high tunnel for early lettuce and greens, and to secure potatoes, sweet potatoes, cabbage, carrots, squash and other storage vegetables so I don’t have to grown them myself. We also exchange work canning tomatoes and freezing bell peppers with each receiving a share of the resulting jars or zip top bags. I started seven trays of my garden seedlings in the germination shed, also part of the deal. I got bags of last year’s soil mix and onion sets that were part of the farm order. There are other sundry items: pallets saved from the burn pile, leftover partial trays of seedlings, and vegetables when there is over-abundance or if they are too imperfect for members. While no money changes hands, there is mutual benefit from barter deals. My car was loaded as I departed the farm. The sound of lambs permeates spring days bringing with it both hope and mortality. It’s a hopeful and sad sound. One that leads me to prefer goats. This entry was posted in Local Food and tagged farming, local food, sustainability. Bookmark the permalink.